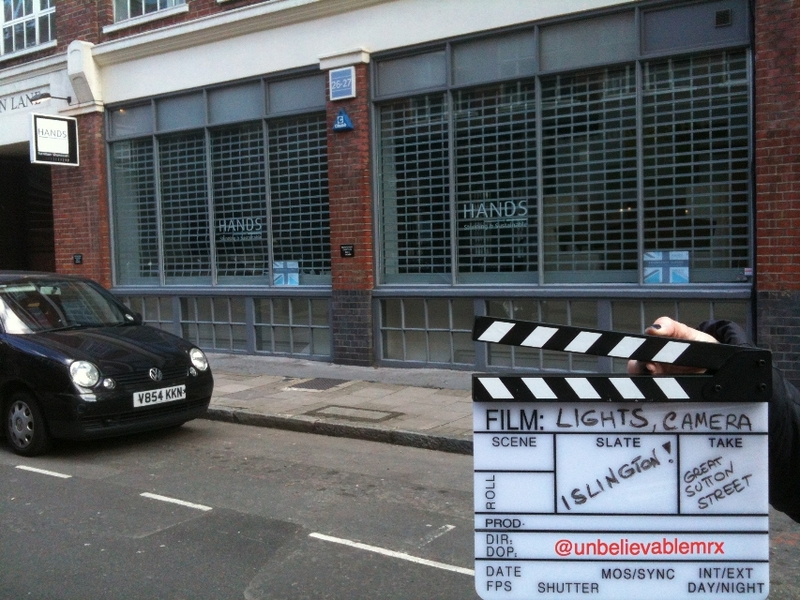 In Great Sutton Street Christmas is All Around, Actually | Lights, Camera…Islington! Switching on the Lights, Advent Calendars, Christmas cards, the Trafalgar Square Christmas Tree, Ice-rinks blossoming across London, Selfridge’s Christmas windows, Christmas jumpers… In case you hadn’t notice the Christmas frenzy is upon us. It is precisely 10 years since rom-com expert Richard Curtis, already behind Four Weddings and a Funeral, masterminded another one of his little gem: Love Actually (2003). Using a tried and tested recipe, Love Actually tells us the story of interrelated characters and couples dealing with their love lives in the madness that is the run up to Christmas. To do this, Curtis brought together a plethora of British actors such as Emma Thomson, Alan Rickman, Liam Neeson, Colin Firth, Laura Linney, Billy Nighy, Rowan Atkinson to name but a few, and not forgetting his trusted accomplice Hugh Grant. All this wrapped up in a well-crafted soundtrack and song selection…Bingo! Ten years on cinemas around the UK reprogram the movie while radio stations blast away Mariah Carey’s All I want for Christmas is You. One item missing from my list above, as you may have noticed, is the sacrosanct office Christmas party. Hate it or love it, this event is an untouchable part of office life, as regular as clockwork. Which is just as well in the present case. In Love Actually, Harry (Alan Rickman) asks his flirty PA Mia (Heike Makatsch) to find a venue for such party. One of Mia’s friend runs an Art Gallery on the South Bank and this is where the event will take place. Well, sorry to say Richard but this did not fool Lights, Camera…Islington! The ‘South Bank’ gallery isn’t on the South Bank at all but…in Great Sutton Street, off St John’s Street! In the movie we mainly see the inside of the gallery but we get a quick chance to spot it first by day, and then on the night of the Christmas party. On this Christmassy note, we would like to wish you all, all the best for the festive season.